Shipping: $0.00 for the first item and $0.00 for each additional item. US only. Estimated to ship by Wednesday, Jun 7. Wallet Ninja - 18 tools in one!!! As seen on tv!!! World's first 100% flat multi-tool. 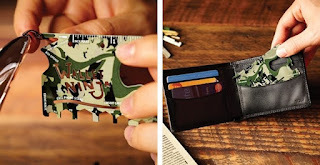 Credit card size. Fits in your wallet. TSA approved!! Approved for carry-on during flight.